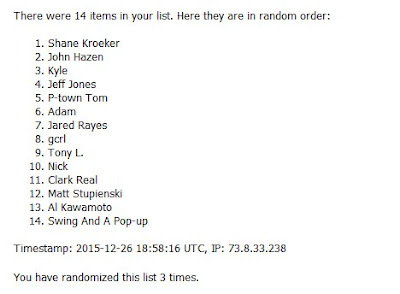 I don't recall typing the name of Shane Kroeker in any of the previous giveaways. I guess if you are going to enter one, make sure you hack the Random website PRIOR to your entry so.... just kidding, Shane. As opposed to others, you are 1 for 1. Hope you like the stack. So what are we putting on the comment auction block today? Post title should be a small hint. Yup. We got Gypsy Queen to give away. Joining GQ is about 3 dozen Heritage (with a Chrome parallel of Michael Brantley) and on the left is just over 2 dozen of '15 Archives. Add it up and we are talking 139 cards. As usual, no dupes. I have been pulling dupes this year. This year, I have also been pulling in a lot of fine Christmas gifts from you folks. My scan folder is filling up fast, as is the stack of White Sox cards I need to sort. Let's clean out a few scans with a couple of shout outs. AJ at the fine Yankee-centric site The Lost Collector, send over a small package of very needed cards for entry into the Sox box. Pacific Online is such a fine over production set. It has everything one would want that screams "turn of the millennium". 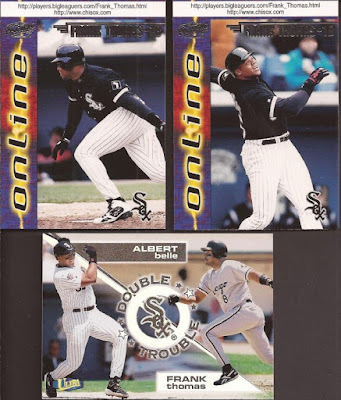 "Double Trouble" is not just a new card, but an insert set I have never heard of from Ultra. For the 2 years Belle was on the south side, they should produced a crapton of cards with him wearing black. 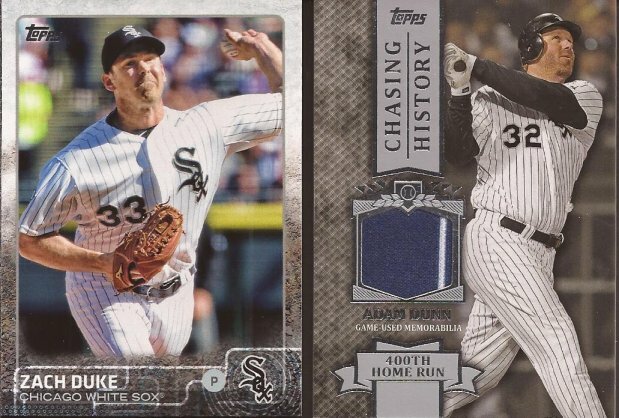 Duke on the left helps with the White Sox 2015 team set. I am now just 4 cards short from writing off the team from the spreadsheet. Donkey on the right is not just a fine relic, but a fine THROWBACK relic, as that is from the Chicago American Giants throwbacks the Sox have worn a couple times. Into the throwback binder with the other blue White Sox relics I have. AJ, thanks for the mailing. If it's not from Canada, Jeff is usually the other person adding to my Blackhawks collection. A couple UD Ultimate, with Martin Havlat and Tuomo Ruutu. 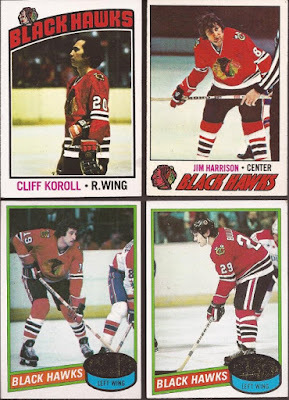 And I have no idea how OPC make it past me all the way to Florida, but I have yet to see any Hawks OPC from the junk wax era, but Jeff dropped a few on me. OH YEAH! 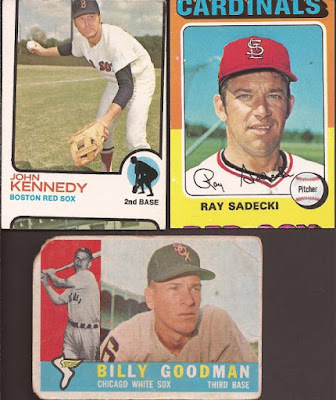 '76 and '77 Topps at the top, and some of the '80 Topps scratch off cards. Interesting idea, as there is no player name on the back of the cards. For the record, that is Ron Sedlbauer on the lower left, and Ted Bulley on the lower right. A fine mailing, Jeff. Alright, comment box is below the video. Enter for your change at some Queen and more. Put me down for another go at it. "doink" That's the sound of my hat being tossed in. Queen Rocks. Dang Wrong blog, Oh well Gypsy Queen is cool too. Give me a crack at the bat. 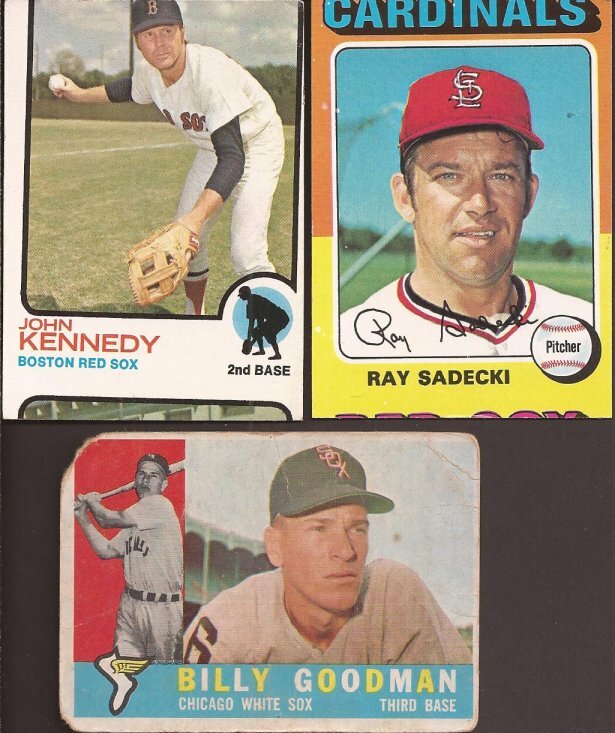 queen would also work if you had a stack of tom gordon cards to give away.